Frank Aragona and crew celebrate Gatornationals win. 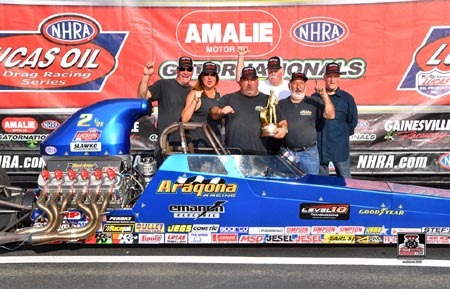 Going into the NHRA season ending Auto Club NHRA Finals at Auto Club Dragway at Pomona this weekend, Frank Aragona Jr. has locked up his second NHRA Lucas Oil Drag Racing Series Comp Eliminator World Championship. The Freehold, N.J., racer racked up 613 points including four wins in six final rounds and cannot be caught. A number of racers were chasing Aragona going into last weekend's divisional event in Las Vegas with most dropping out of contention including 2017 champion David Rampy. The championship was officially locked up when Clint Neff elected not to enter this weekend's event in Pomona, Calif.